As a part time blogger and full time college student I really wish there was more time in the day. Not just time to accomplish all my task for the day but time left over just to enjoy myself. So this summer I am determined to find a balance in my life between blogging, college, and doing more living. I've been trying different things to help me feel more productive and accomplish almost everything I need to in a day with plenty of time left over. Of course I wanted to share some of those things with you. As cliche as it sounds "the early bird catches the worm" I realized the earlier I wake up the more I get in the day. So instead of sleeping in and waking up at noon finishing my task around 4:00pm or 6:00pm. I could wake up earlier and finishing my task by noon. I know that should be a no brainer but it never occurred to me before because I am not exactly a morning person. In order to wake up early and have the energy required to do your task you do have to sleep a bit earlier. For night owls I know that's asking way too much. I am not saying sleep at 8:00pm or 9:00pm however sleeping at 10:00pm or 11:00pm won't hurt. You will really see a difference in your mood and your overall day. I wasn't always a fan of making to do list but now I love them. I make list for just about anything. It's something you really need to try and see how it works for you. It's very important to prioritize your list. 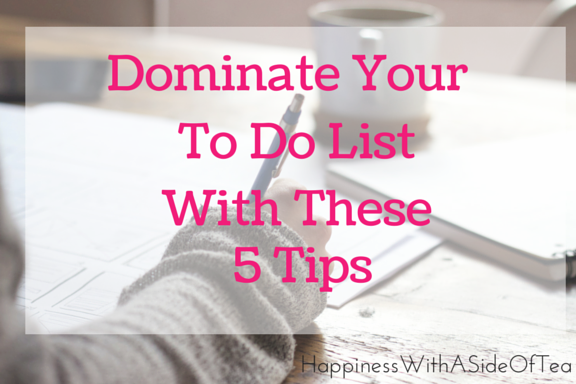 In my post 5 Essentials To Productivity I explain to you how you should prioritize your list and task. I'm always glued to my phone and when I have things to do I am constantly on social media looking for a way to get out of them. I suppose that's just the procrastinator in me. However it's so easy to get sucked into those distractions and time seems to fly by but you never even notice. I find it best if you turn off your phone completely and avoid the temptation. If you can't turn off your phone then leave it in another room where you can hear it but make sure it's out of your site. You will see how much more you can get done with those distractions gone. This helps prevent burnout. Take your time with each task making sure it gets done properly. It's perfectly okay to take a 15 minute break and eat a snack or grab lunch. Taking a break helps your body recharge its self so when you come back to your list you're energized. I think this really just depending on the person. A lot of people can be more productive without a real schedule. However I am the person who always needs a game plan even if it might never work out the way I planned. I just like having that certain direction I am working towards. If you're like that then a schedule can really be beneficial for you. You don't have to follow that schedule religiously however it does give you a sense of direction. Having that sense of direction really helps you become less stressed which overall helps your productivity. You really get anything done properly when you're stressed. Trust me I've tried. Overall it's important to remember that you're probably not going to accomplish everything you needed to do in a day. That's perfectly okay be proud of what you did accomplish and add what you didn't finish that day to your list for the following day. Hopefully you found these tips helpful. Here's another post on productivity that might help you 5 Essentials To Productivity. What Are Your Tips For Staying Productive?